Owl's Head, Sherman Hill, and the newly minted River Bend are Des Moines' three locally ordinanced historic districts. A word to the wise: if you own property in one of these areas, please read and understand the guidelines. Jason Van Essen (515-283-4147) at the planning department is more than willing to help people through the process and explain the guidelines as they relate to individual proposals. The Des Moines Public School District is looking at school attendance area boundary changes for the first time in 25 years. This is sure to ruffle some feathers - there's no good way to do this without disappointing some people. Indeed, we chose our neighborhood in part based on the assumption that our kids would attend Roosevelt (in many years). Looks like that will still likely happen. Geographically, the proposed boundaries appear more compact - this is good. Roosevelt will trade much of the southwest corner of the city for downtown and Sherman Hill. The official announcement website also outlines the demographic shifts. It appears they tried to move towards equalizing numbers of minority students and students receiving free and reduced-price lunches. This is also good, though there is still some room left for movement. The Des Moines Register reports that the... erm... well, Des Moines Register has signed a lease to move its offices. 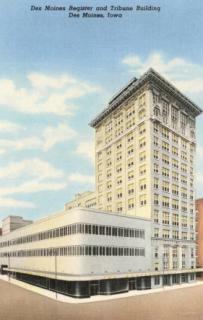 The venerable Des Moines institution will be leaving its long time headquarters at the eponymous "Register and Tribune Building" and relocating to the Capitol Square building. At least they are staying downtown... no mention of any incentives given by the city to keep them in the central core. I wonder if the Juice staff got a vote. Which brings us to the only reason anybody not from Iowa knows that Iowa exists: voting. Via the Business Record and KCCI, it seems that there is extraordinarily high demand high for absentee ballots. I am trying to decide whether to vote early (starting Thursday) or to hold out until election day and do the deed in person in order to make my candidates sweat a little. I'm leaning towards voting early, just in case something happens. Not that I won't be glued to the TV set all day on the first Tuesday after the first Monday in November. Via the Business record, Southridge Mall renovations continue and five new retail stores are announced: Foot Locker, GNC, rue 21, and T-Mobile. The new owner is partway through phase one of proposed improvements starting with demolition of 296,000 square feet of mall space earlier this year to make room for new retailers, entertainment offerings, open-air storefront, and a proposed pedestrian plaza with outdoor seating. Here's the problem: Southridge is located in a pretty bad place for a mall and doesn't have a whole lot around it to make the drive worthwhile. It's the underlying problem with suburban-style development in a City. If I have to get in my car to drive somewhere 15 or 20 minutes away, my options become much greater - technically exponentially greater. From my house in the Drake neighborhood it takes about as long to get to West Glen or Merle Hay as it does to get to Southridge. You have to be DIFFERENT and WORTH the drive. Des Moines doesn't need another Jordan Creek. We need more Des Moines! There is nothing fundamentally different about the Target at Southridge versus the Target at West Glen. A city's job is to get people out of their cars! As long as cities try to compete with the suburbs using suburban development patterns, they will lose. If the mall owner were to throw this design problem to a group of creative designers, I bet there would be some creative and unique solutions... none of which would include an Applebee's outbuilding. Campaigns scratch you off the phone call list.